I downloaded a very important document in .docx format (Microsoft Office Word format). Is there a way to convert it to an ebook page by page to read on a Kindle? There is a very easy way to do this with no extra software required. Since you asked about the Kindle specifically, you can just let Amazon take care of the conversion for you automatically. Fist there is one time configuration. From the Amazon website, load up Manage Your Kindle. From there find Personal Document Settings in the menus. The first heading on the page should be a list of your Kindle devices and their settings. Identify which device you want to read your documents on and note the email address that has been assigned to it. Also make sure lower down that any and all addresses from which you might wish to send yourself documents are in the approved senders list. With that out of the way, you have to do is send an email! Address it to your Kindle's address. Set the subject line to "convert"
Make sure you are sending from an address you have authorized. Presto, the document will be converted to the native Kindle format and sent to your device using Wispersync. If you fail to use exactly that subject line, you will only get the file in its original format. By using the word "convert" in the subject you trigger Amazon's servers to convert it to a more usable format for you. 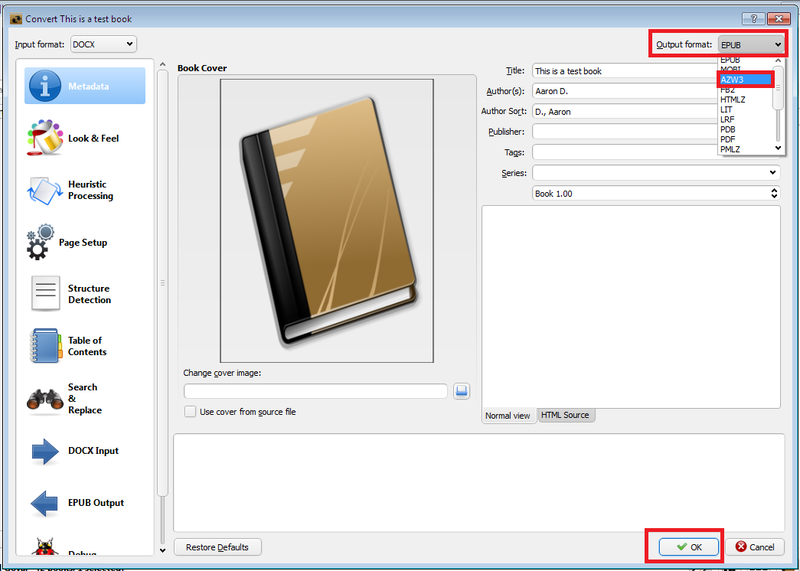 1 This trick also works for PDF and a number of other formats. The usability of the results do depend on how cleanly formatted the original document was. According to the Calibre supported formats list, .docx is one of the supported input types. For the Kindle, you probably want to use AZW as the output. So you should go to the Calibre website, follow the links to download the appropriate version, install it, and follow the directions on how to add your .docx file to your library and then convert it to AZW. I'm very comfortable with reading PDF documents on my Kindle Classic (I'm using landscape mode). I'm converting Office documents to PDF using OpenOffice. Current version of OpenOffice can convert also docx documents into PDF, so this is the way I'd recommend for you to consider. As far as I am aware, PDF files work fine on the Kindle and can be converted to that form directly from Microsoft Word. As shown below, when you go to save the Word document, you can choose to save it as a PDF. I would recommend saving as a DOC/DOCX file before you do this, so that you have a backup in case anything goes wrong. You would then just transfer the newly created PDF file over to your kindle via the USB cable and it should open perfectly fine. My brother used to do this for his university reading. Disclaimer: I work for Nevron Software. PDFs are not a good option to export ebooks as they cannot be reflowed. As a consequence text may not be readable on smaller devices. I work for a company that created a small text editor similar to MS Word which supports reading and writing of EPUB, Rtf, Docx, Html and PDFs files. You can view it here: http://www.nevronoffice.com. The free online version (requires Silverlight) can be used to convert your document from DOCX to EPUB. 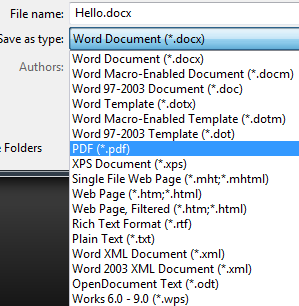 Another option would be to save your .docx file as html and use Kindle Gen from Amazon to convert to .mobi. How to convert tagged articles into a single ebook without losing tags for reading on kindle? e-mail azw to Kindle Personal Documents Service?